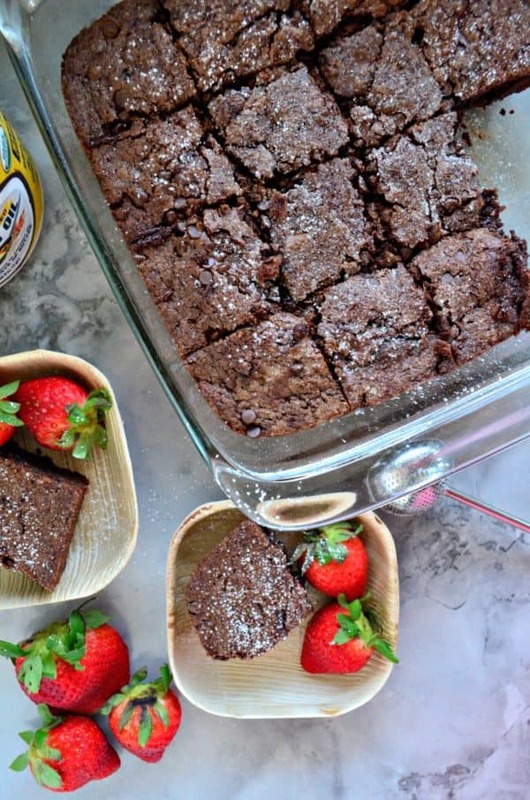 I’m so excited to share today’s recipe for dairy free dark chocolate brownies. They are soft, chewy and oh-so fudgey. Is fudgy a word? If not, I’m declaiming it one. One food I’ve missed the most while being dairy-free was brownies. 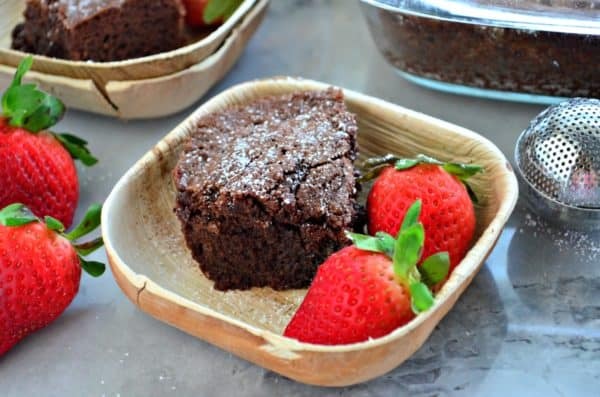 These brownies are a take on my dairy-free chocolate mug cake. Just in a much larger batch so that everyone can share. Today, is my husbands birthday (Happy Birthday Jon!) and I normally love to post something on his Birthday that he really enjoys. Ironically, my husband is not a fan of chocolate. Gasp! I know–what is wrong with him? He did; however, try these brownies with a big scoop of ice cream to balance out all the chocolatey goodness and he liked them. I actually made these for dessert for my out-of town family and they absolutely loved them. No one realized they were dairy free until I said something. They devoured the brownies—some going back up for seconds even thirds. Which was good for me—less calories for e to eat during the week. Let’s face it. If I have a dairy-free treat in my home I’ll eat it until it’s gone. I’ll “treat” myself to a dessert after lunch, a mid-afternoon snack and for dessert after dinner. I can’t help myself. You might wonder, how the heck did I make these brownies dairy free? My secret ingredient is Barleans Butter Flavored Coconut Oil. It’s the perfect 1:1 substitute for butter. I took my go-to dark chocolate brownie recipe that I’ve been making for years and gave it a try with Barleans Butter Flavored Coconut Oil. I’ll be honest—the taste of the brownies did not change in my opinion. Even better, the coconut oil cut additional calories and fat from the brownies. 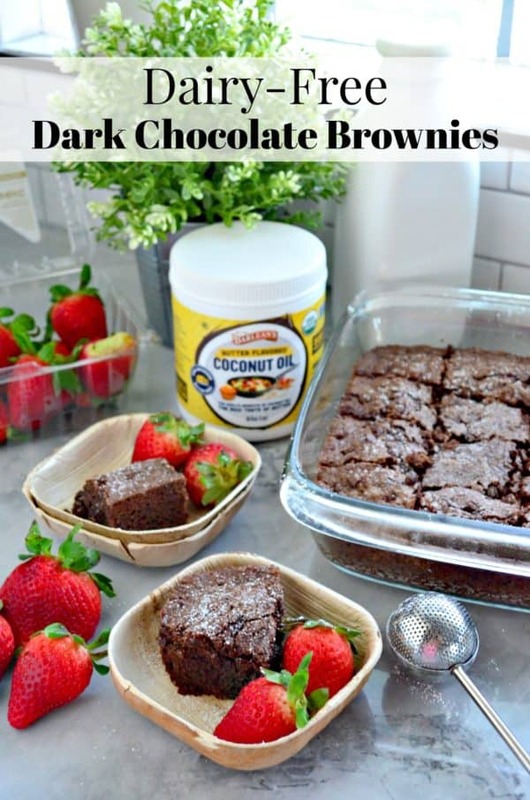 To keep these dairy free I used cocoa powder instead of melting the chocolate chips to give it that dark chocolate flavor and keep the brownies dairy free. For those not dealing with a dairy allergy I served the fudge brownies with a scoop of vanilla ice cream and a few fresh strawberries. These brownies made for a delicious and easy-to-make homemade dessert. Preheat the oven to 35o degrees Fahrenheit. Melt the Barleans Butter Flavored Coconut Oil. Then place it in a stand mixer fitted with a paddle attachment. Add the granulated sugar and cocoa powder and cream for 30 seconds. Then add in the eggs, vanilla extract. Mix for an additional 30 seconds. Mix in the baking soda and all purpose flour and mix until batter is mixed well and thick. Add in 3/4 cup of the dairy free chocolate chi and mix for 5 seconds. Grease a 9x9 glass baking dish with a little bit of the coconut oil. Then, pour in the batter into the dish. Using a flat spatula smooth out. Sprinkle the remaining 1/4 cup of chocolate chips on top. Bake for 30-35 minutes or until brownies have set crispy on edges. Let the brownies rest for 30 minutes before slicing. Store for up to 3 one week in the refrigerator. These look FAAAAB and love that they’re dairy free!